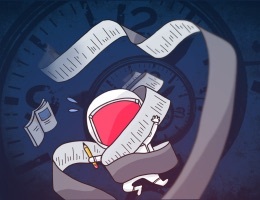 Edison Mail is one of those email apps for iOS I should have discovered a long time ago. There are numerous options to best Apple’s own Mail app, but nothing has ever stuck for me. Until Edison. 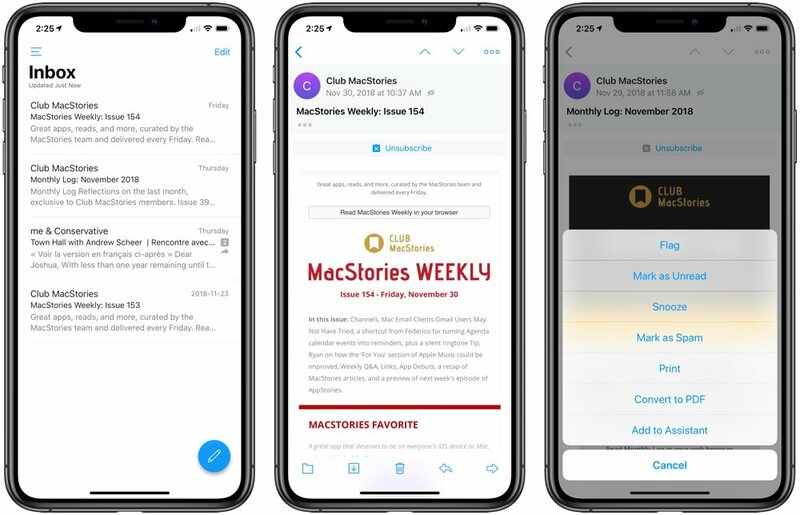 Edison Mail is currently iOS-only and offers a clean, well-designed UI that feels on par with iOS 12. Edison also provides a range of now-expected email options, like snoozing and attachment lists. I also like the quick functionality to create a PDF of an email (something I use a lot more now during my day job than ever before) right from the “…” button. Edison’s hallmark feature is its Assistant, though. Edison’s Assistant scans your email constantly and creates custom filters for you to categorically process your email. By default, there are Assistant categories for subscriptions, travel, packages/deliveries, bills and receipts, entertainment, and security. You can also feed specific emails into the Assistant so it can learn your habits and needs. And, best of all, the Assistant provides a quick, one-touch button to unsubscribe from unwanted spam email. In the “Subscriptions” Assistant filter, all your email subscriptions appear in one long list and you can either favorite the subscription or unsubscribe right from the list. So far, this is my favorite Edison feature and has dramatically decreased the amount of email I receive each day. Edison has quickly become my favorite iOS email app in a long time and I eagerly await its Mac counterpart. You can download Edison for iPhone and iPad from the App Store. 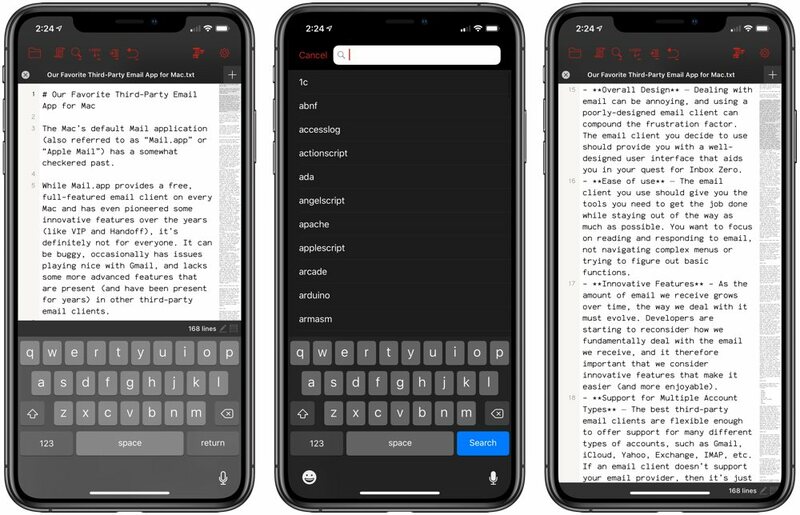 Kodex is a simple text editor I discovered through the Club MacStories weekly newsletter. 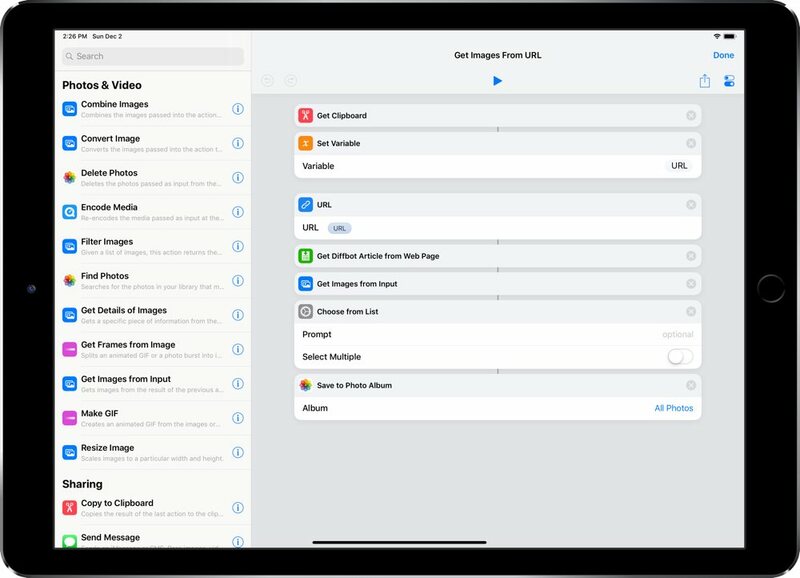 As Federico Viticci pointed out in that newsletter, Kodex is a fantastic app for using the Files app “Open in Place” feature to open a file in any app in iOS. Should you need to make a quick change to a text file, Kodex can open a file in the Files app, make the change, and save it back to Files, all without having to duplicate the file inside the app. This is super handy for quick changes and quick previews. Kodex also includes a range of coding specific features, many of which fall outside my usage. The app has multiple cursor support, quick encoding support, custom keybindings, and more. 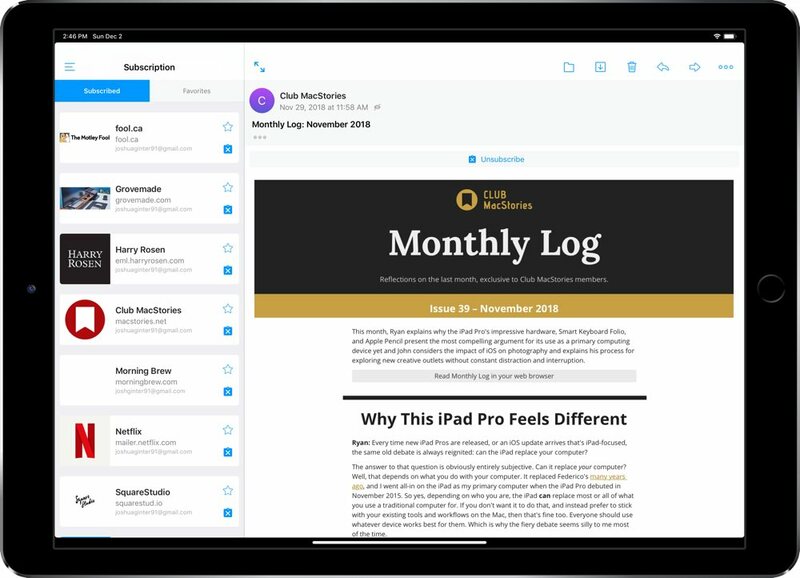 Kodex has also been updated for the latest iPad Pros. You can download Kodex for iPhone and iPad for free on the iOS App Store. Here’s a simple shortcut that’s perfect for extracting images from a URL. Each morning, when I update The Sweet Setup’s deals page and buffer some tweets, I need to grab a quick image of the product before sharing on Twitter. This shortcut has made short work of grabbing a high-quality image before sharing. Simply copy the URL of the page you’re going to extract an image from and run the shortcut. The shortcut grabs the URL, creates a Diffbot article from the webpage, extracts the images, and puts them into a list for you to choose. 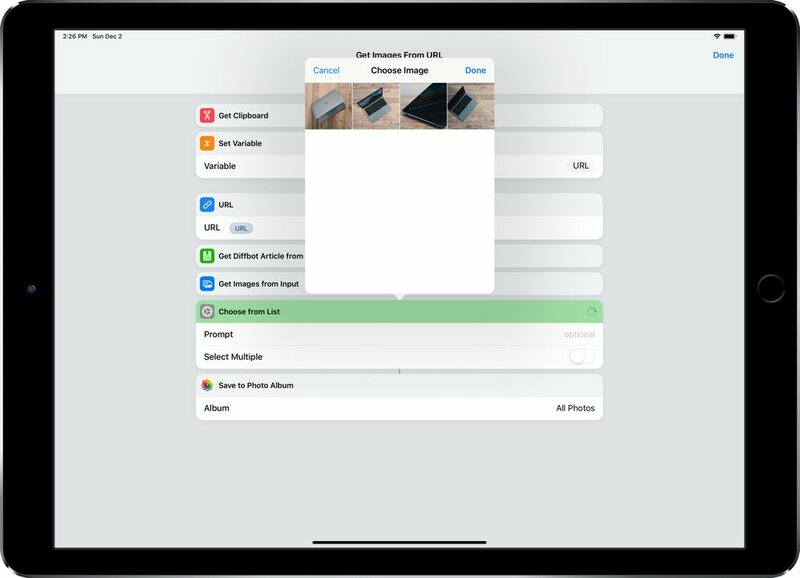 As it stands, the shortcut allows you to choose only one image at a time, but you can hop into the Shortcuts app and toggle the option to “Select Multiple” to allow for multiple image choices. 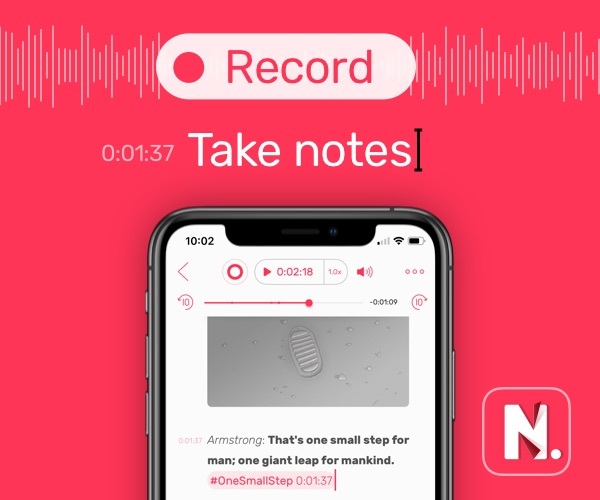 Shortcuts continues to make my life easier on the iPhone and iPad, and my interest in a Shortcuts for Mac continues to grow. This handy image extractor is a perfect example of a task that is easier (at least for me) to execute on the iPad. You can grab the shortcut right here.